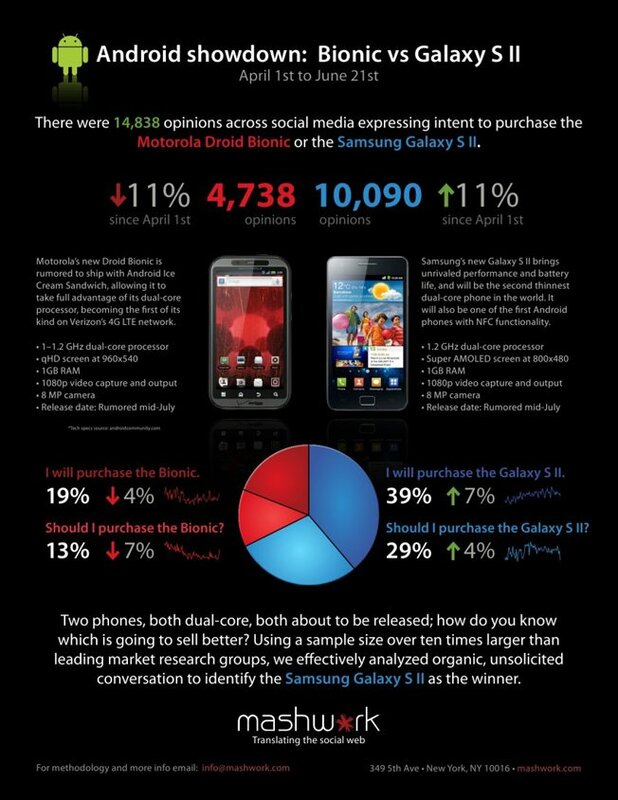 What you are looking at, is an infographic that details the amount of social buzz that both the Samsung Galaxy S II and DROID Bionic have received from a period of April 1 – June 21. According to the compiled results that were created from this buzz, a research or marketing firm has decided that the Galaxy S II is going to crush the Bionic in sales, once they are finally released. And how did they come to that conclusion? Well, out of those 14,828 (10,090 for the SGS2 and 4,738 for the Bionic) opinions they gathered from a variety of social networks (including Facebook and Twitter), 39% of people said they were going to buy the Galaxy S II compared to just 19% for the Bionic. The results also show that only 13% of people are considering the Bionic while 29% are interested in the newest device from Samsung. Interesting right? Except there is one major flaw in this comparison: carriers. How can you compare the sales of a device that will hit 1 carrier to a device that will more-than-likely land on all 4 of the major carriers in the U.S.? Basically, there are customers of 4 different carriers here that all have a shot at the SGS2, when the Bionic is really just available to Verizon customers. Obviously people could change carriers to get the Bionic, but I’d put a lot of money on a stat out there somewhere that shows how unlikely people are to change carriers over a single device. Look at how many customers stayed with Verizon year after year without the iPhone because they they were unwilling to switch to AT&T? In essence what I’m saying, is that this marketing firm decided to compare a device which we all know will have 4 times the carrier reach than another who is headed to just 1. Umm, it’s pretty obvious who is going to win that battle. And if we’re talking social buzz here, that also means there are 4 times the people that would be talking about this phone rather than the customers of just 1. I love the Galaxy S II and all (our hands-on with it) and will be recommending the hell out of it to our readers, but this comparison makes almost no sense. And because we’re snarky a-holes at times, we have to point out that huge error in the Bionic listing which states that it’ll launch with Ice Cream Sandwich. Apparently this marketing firm knows something that every single Android guru on the planet doesn’t, including Andy Rubin who told us ICS wouldn’t be ready until Q4.